These places never see sunlight, are buried deep under thick ice crusts and warmed mostly by radioactive decay and tidal forces: subsurface oceans of celestial objects far from their stars—if they have any. Decades ago, they were the domain of science fiction, until such places were hypothesized in our solar system thanks in part to Voyager flybys of Europa in 1979. Shortly after, the idea was popularized when it appeared in Arthur C. Clarke’s Space Odyssey saga. Since then, we learned much more about characteristics of possible subsurface oceans, discovered that they probably exist on more worlds than we dared to expect just a few years ago, and that they’re more fascinating than even SF authors hoped. 1979 changed our view of Europa forever. Images sent by the Voyagers sparked great interest in the moon. The surface was peculiar: quite smooth, with high albedo, few impact craters and a lot of strange ridges and cracks. This led to speculations about the existence of an ocean of liquid water under the outer ice shell. This would enable geological activity strong enough to erase older features like impact craters and provide extensional stress on the crust, resulting in formation of linear troughs we see on the surface. Later, observations were able to tell us that these notions are most likely true. An ocean is the simplest explanation for the diverse geology of Europa’s surface. Some of the present chemical compounds, couple with the interaction of the moon with Jupiter’s magnetosphere indicates presence of liquid water underneath the ice layer. In the giant’s magnetic field, Europa produces an induced magnetic field that would not be possible without a layer capable of conducting electrical current. The strength and direction of the induced field suggests an ocean of liquid water with a high concentration of dissolved salts and acids, at least a couple of dozen or more than 150 km deep. These findings kindled a lot of enthusiasm about Europa, and lander missions were proposed. So why aren’t we there already? Besides worries about contamination, there is a serious technical problem. Jupiter’s strong magnetic field interacts with particles around the planet (mainly released from Io’s numerous volcanoes) and creates strong radiation belts full of accelerated ionized atoms and molecules. They caused Pioneer 11 to lose the majority of images it had captured of Io. Even the probe Galileo, constructed to withstand the harsh environment close to Jupiter, experienced glitches due to the radiation. Unfortunately for our plans of space exploration, Europa is right inside the belts. Any spacecraft to land there would have to endure extreme levels of ionizing radiation that would kill a human, even equipped with a space suit, in less than an hour. Sorry, Arthur C. Clarke, but astronauts walking on the surface of Europa shall remain science fiction. Another problem for any missions to explore Europa’s oceans directly is that we don’t know the thickness and structure of the outer ice crust. Should we expect it to be just a few or several dozen kilometers thick, formed by hard brittle ice only or with additional warm convecting layer underneath? And if a device tried to melt through the shell, wouldn’t it quickly become encrusted in salts and trapped? So far, ESA’s JUICE mission is planned to be launched in 2022 and to explore Ganymede, Callisto and Europa. All lander missions are still just concepts and will likely remain so for a long time, until we know more about the ice shell and the ocean. Until the new spacecraft is able to tell us more, we can only speculate about the characteristics of Europa’s ocean. Let’s take a closer look on whether it could potentially support life as we know it. Life needs a few basic things to exist: water as a solvent, an energy source, building blocks, chemical and energetic disequilibria. All of that can be found on Europa—but whether they are in sufficient quantities, we don’t yet know. Liquid water is not a constraint—even in the case of a very thick ice shell, there’s most likely at least two times more than in the Earth’s oceans. But water alone is not enough—any life would need chemical cycles to emerge. Without them, some substances could quickly become depleted or too abundant. The ocean also needs to be in contact with the rocky mantle for geochemical cycles to exist. According to most models, it is; but some predict a layer of high-pressure ice beneath the liquid, which would restrain access of water to the rock underneath. If material leaches from the bedrock into the water, the essential building blocks for life should be evident. Their concentration would likely be low, however, but many Earth extremophile microbes can cope with that. The salinity and composition of the ocean remains another unresolved question. Based on the induced magnetic field and chemical compounds on the icy surface, it can be slightly less salty than Earth’s ocean water or in contrast, almost twice as salty as the Dead Sea. In the latter case, only the most extreme halophile bacteria could survive such conditions. Saltiness might not be the biggest problem. Imagine an ocean full of hydrolyzed sulfuric acid, with a pH less than 1. That’s one extreme—but it can be highly alkaline as well. It can also be relatively reduced or oxidized, depending mostly on Europa’s early history. Jupiter used to be warmer in the early days of the solar system and Europa could have had an ocean on the surface and an atmosphere of mostly water vapor. In such a case, the ocean would likely become oxidized. As for temperature, it can be somewhere between a few °C above zero and -40 °C—still liquid thanks to high salinity and the anti-freeze effect of ammonia. Near hydrothermal vents, should there be any, the temperature could rise to a couple of hundred °C. Organisms on Europa would also need to be able to withstand high pressure. On Earth, microorganisms capable of reproducing under extremes of all the above conditions together exist, many of them in the genus Halomonas. And with enough oxygen—which could be produced by breakdown of water by radiation occurring in the ice shell and absorbed into the ocean—even more microorganisms might possibly survive there. How would possible Europan life gain energy? Methanogenesis, which can occur under a wide range of conditions feasible in the ocean, seems the most likely candidate so far. Depending on the real parameters, a Europan ocean might be capable of supporting several trophic levels and therefore a sustainable, albeit probably poor, ecosystem. Europa is the most famous object with a probable inner ocean—but only one of many. Other two Galilean moons, Ganymede and Callisto, are also believed to host a subsurface body of liquid water. However, most models suggest that their oceans are “sandwiched” between the outer shell and a layer of high-pressure ice beneath. Without a direct connection with a rocky mantle, they would lack conditions for life that Europa might potentially harbor. Image 1: The four Galilean moons. Europa, Ganymede and Callisto are all thought to have subsurface oceans. However, in Ganymede’s case a thick layer of high-pressure ice beneath it is predicted. In Callisto’s case, this layer is believed to be much thinner, but note that the moon’s interior is not differentiated, unlike the other Galilean moons. As far as we can tell from gravitational pull data, it’s a relatively uniform mixture of rock and ice. Unlike bedrock of a differentiated mantle, it wouldn’t provide many opportunities of geochemical cycles and any hydrothermal activity is highly unlikely. Courtesy of NASA/JPL-Caltech. If we move from Jupiter to Saturn, we’ll encounter one of the most intriguing bodies of the solar system: Titan. Under the orange-brownish haze of its dense atmosphere, there are alkane seas and rivers, tholin dunes and methane snows. About two hundred km underneath this fantastic landscape, an ocean of water and ammonia might be hidden. But according to most models, it’s trapped between two layers of ice as well. Another fascinating object orbiting Saturn is the tiny moon Enceladus. Ever since the Cassini spacecraft observed geysers on its south pole, its cryovolcanic activity remains a mystery. Current tidal heating of the moon is negligible, and so should be the amount of radioactive decay due to its small size. Models of radioactive heating failed to explain the ocean—yet the moon is very active. Its surface appears young and long linear “tiger stripes” near the south pole indicate extensional stress: an indirect sign of subsurface liquid. More intense past tidal forces and present shear heating have been proposed but it’s still not certain whether they’d be sufficient for keeping the little moon spawning ice particles into Saturn’s previously mysterious E-ring. Most models suggest a large pocket of water underneath the south pole but a global ocean is not ruled out. What’s more, it’s likely in contact with bedrock and many authors agree that the geochemical conditions for life might be met. Image 2: A false-color mosaic of pictures of Enceladus taken by the Cassini spacecraft. The famous “tiger stripes” can be seen near the south pole where geysers were also observed. Courtesy of NASA/JPL/Space Science Institute. Existence of a subsurface ocean is also feasible on several other Saturn’s moons: Dione, where water vapor was recently detected, and Rhea; less likely Tethys and Iapetus. 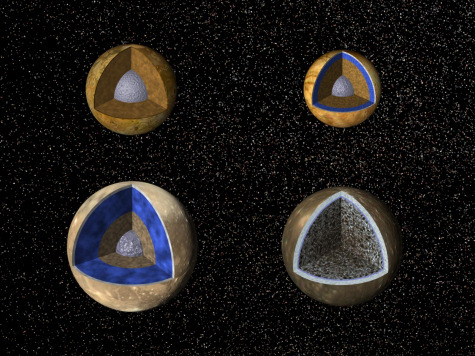 Similar claims were made about Titania and Oberon, the largest moons of the ice giant Uranus. But for an example of a truly cryovolcanically active body, we need to move even further: to Neptune and its only large satellite, Triton. Triton is thought to be a captured Kuiper belt object due to its retrograde orbit, high tilt and the conspicuous absence of other large moons. It’s theorized that Triton might have “kicked them out” in the wild early days of being caught by Neptune’s gravity. Plumes of water have been detected on Triton and its surface tells a similar story to that of Europa or Enceladus. During the early epoch of the solar system, tidal heating of the captured moon would be significant, enough to melt a part of its icy interior. These oceans, covered by a shell that doesn’t conduct heat particularly well, might have a long duration. Combined with radioactive decay and enough anti-freeze compounds like ammonia, plentiful in these regions of the solar system, we can see that it’s likely not easy to freeze an ocean once it’s there. But we need not to be constrained to moons of the giants. If we look closer, in the space between orbits of Mars and Jupiter, we find a wide asteroid belt. Could bodies of liquid water be there too? Just recently, water vapor was detected on Ceres—the largest object of the belt, containing about one third of the mass of the whole belt. The spacecraft Dawn is scheduled to arrive to the dwarf planet in February 2015. However, the asteroid belt between Mars and Jupiter is just a playground compared to the Kuiper belt. Beyond the orbit of Neptune lies an area where our Sun appears as a mere very bright star, and countless worlds of ice take their long journeys around it. The best known Kuiper belt object is the dwarf planet Pluto, with its faithful companion Charon. When the probe New Horizons was launched, Pluto was still considered a planet, but was reclassified shortly thereafter. This changed nothing about the fact that Pluto is an interesting and mysterious object. No close observations have been made yet—but that’s about to change in 2015 when New Horizons should reach Pluto, its large moon Charon and four smaller moons. During the flyby, it might tell us more fascinating facts about Pluto than expected. In 2006, shortly after the probe was launched, a study by Hussmann et al. explored the topic of radiogenic heating of mid-sized icy objects. They found that most models permitted the existence of a subsurface liquid body of water not just in Pluto and Charon, but also a number of other Kuiper belt objects. If an ocean truly is inside Pluto, no fossil bulge from an early period of faster rotation should exist—the influence of the ocean would erase it. Observation of cryovolcanism—indicated on Charon by the spectroscopic detection of crystalline water ice—would be an even better proof. Next year, we shall see. Eris, a dwarf planet discovered in 2005, might be an even better candidate for an ocean under ice than Pluto due to its larger size and therefore more radioactive elements. The list of Kuiper belt objects likely to host subsurface liquid water might also continue to grow including bodies like Quaoar and Orcus. The furthest object of the solar system, for which a subsurface ocean has been proposed, is the dwarf planet Sedna. In its perihelion, the point of the least distance to the Sun, it’s 76 AU away from our star—still more than twice and half further than Pluto in its own perihelion. However, due to the extremely high eccentricity of its orbit, Sedna travels as far as about 940 AU far from the Sun in the aphelion—much more than seven times the distance Voyager 1, the furthest human-made object, has made until now. Like Triton, it can tell us a wild fascinating story about the origins of our solar system—if we listen. It’s hard to imagine that oceans of liquid water would exist so very far from the Sun but models of radioactive decay suggest it’s possible. And with enough ammonia and a well-isolating shell, even an ocean with temperature around -100 °C might exist. Sedna is just one of the solar system objects that proved that our own system is more fantastic and its history more compelling than we could imagine. But our gaze inevitably travels to other stars as we ask ourselves a question whether conditions suitable for life exist out there. Existences of subsurface oceans have been proposed for several known exoplanets, namely three planets in the Gliese 667 C system (f, e and d) and Gliese 581d. Will we ever find out whether these predictions are true? Detection of subsurface oceans on extrasolar planets would be complicated—but nevertheless feasible. We can use the same indicators of cryovolcanism as for the objects orbiting our Sun: crystalline water ice and ammonia hydrate. They can be detected spectroscopically, hopefully by the next generation of telescopes like proposed FINESSE, ESM, EchO and last but not least the JWST, planned to be launched in 2018. But should we constrain ourselves just to looking to other stars? We’ve already discovered a couple of starless, rogue planets. Some may have been ejected from their birth systems, and some may have formed on their own in case of brown dwarfs. 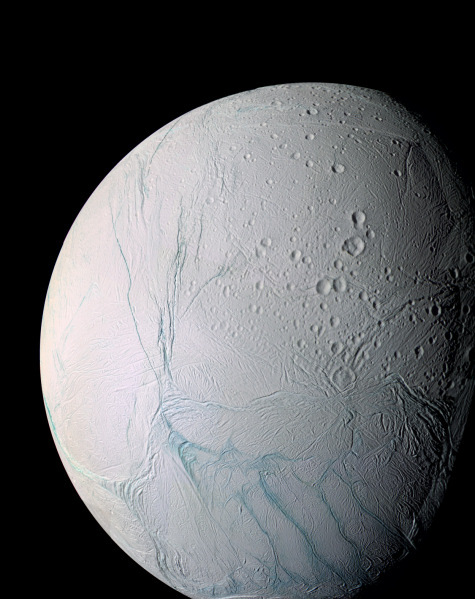 Some may host subsurface oceans under thick crusts of ice; some may have exomoons with such conditions. There are at least one hundred billion stars in our galaxy. Many of these systems could be homes for objects with subsurface oceans; we need not look just into narrow “habitable zones” for such places. And according to the more optimistic estimates, there can be twice as many free-floating planets than there are stars in the Milky Way. Though most subsurface oceans would probably have trouble supporting even extremophile life forms as we know them, they still may be one of the most abundant environments potentially suitable for life. Looking at our own solar system and beyond, we can see countless worlds full of the most intriguing possibilities. Special thanks to Tomas Petrasek, Czech author of astrobiology popular science books “Vzdalene svety I, II” (“Distant Worlds I and II”), for beta-reading the article. The dwarf planet family also seems to be growing as three discoveries were announced in the course of the last couple of days. FY27 is likely even larger than Sedna - making the radiogenic heating probably quite significant. The other two, VP113 and FY17, are smaller - but still extremely interesting, especially VP133 with its highly eccentric orbit. Hope it helps someone expand their horizons even more! This field is changing rapidly and it's really exciting. Let's hope for even more great news from Cassini and soon also from New Horizons as it makes its flyby of Pluto and Charon. Thanks for the very interesting article aimed at us non-scientists, Julie. I think it's head-scratching that most people -- and in schools around the world, children -- think there's still nine planets in our solar system. Tyson DeGrasse was the first person I've watched dismantle this theory, based on some of the points you've aptly described here. I've read the ESA and NASA still disagree on the "nine planets" versus "many planets" classification. Do you know what the latest news on this is? Also, a friend of mine who works on a large science boat off the coast of India, emailed me that they've discovered and classified many new micro-organisms, many of which are extremophiles that could exist in much harsher environments than Earth's sea bottom. They're trying to find out if any of them might in fact be alien. Do you know of any investigations like this going on round the world, and what they might've found? Alan Stern, the lead scientist of the New Horizons mission, disagrees with it. His arguments are sound too: It has a round shape, inner differentiation, seasons... His proposed definitions also have ground to stand on, they just focus on different features. Another accomplished scientist from "the other camp", Mike Brown, who presently might be the biggest expert on TNOs, would oppose these and argue that the orbital neighbourhood is a better ground for defining planets (he's the discoverer of Eris and other dwarf planets and one of the proposers of the current IAU definition). And if Pluto was reclassified as a planet again, there would be no practical reason for not classifying the rest of similarly sized objects as planets. The Solar System would soon become quite confusing to teach at schools and it might influence how good would some grant proposals sound, but in the end, it's very arbitrary. As to the latest news about it, I haven't notice anything except the occassional critique recently and it doesn't seem to me as if a new IAU-sanctioned definition was coming, even though there is not a full consenzus about the current one. Definitions are always useful but if they're taken too literally and strictly and more attention shifts to them than to the real problems, it usually doesn't lead anywhere (Where is a generally acknowledged definition of life? Or a definition of science fiction that wouldn't have plenty of special cases?). As to new discoveries of extremophile microorganisms, that is a very promising field! Nowadays more and more new species can be discovered because of relatively cheap environmental sequencing and then investigating some of them directly later if possible. However, I don't know any extensive list of ongoing research - many universities and societies are involved in it. Especially topics like enzyme stability, metabolism and replication in extremophiles are vastly studied across the whole world. As to specifically field research, especially NASA devotes a lot of resources to it and collaborates with many other organizations on it - but that's just a slice of the whole pie. Algologists at my university (Charles University in Prague) study single cell algae in glacial environments a lot, which might eventually bring some insights into possibilities on icy worlds (hopefully). Sorry that I'm unable to provide more information but I'd just have to google through the lot of extremophile and astrobiology research groups and try to list them. And as to what might have been found: I have no information about anything that would likely be considered alien (so far everything studied uses the same molecular code, with minor variations, and has similar core metabolic pathways), but there are many fantastic organisms capable of surviving high radiation doses, high/low temperatures and vast pressures. I hope I answered your questions at least partially. Feel free to ask more! My eleven-year-old nephews not long ago told me they're learning about the nine planets in our solar system. I asked them if their teacher had talked about the fact there might be more than nine "official" planets now, and they looked at me funny. It's an issue that affects upcoming generations of children, I think, and the way they conceive of our solar system. Most people, including children, DON'T realize that classifications of our local planets have changed. But I'm very glad scientists are doing it. I tip my cap to their great efforts. Do you think more information needs to be shuttled to the public about our changing local planet classifications? Or will such knowledge make its way, like most emerging science, slowly into public thought? I'd be interested to read your thoughts. It surely would be nice if teachers followed current developments more closely and taught more up-to-date information. The change of planet's definition received quite a lot of attention in the media in 2006 and yet a lot of people missed it. But these things have a tendency to drift into schools and to the public eventually, so I wouldn't be pessimistic about that. And I think that this particular topic is being shuttled to the public quite decently. If I compare it for example to school outlines regarding evolutionary biology, it's still a great situation; in biology, even prospective scientists mostly hear about evo-devo approach only after they go to a college or a university (maybe things are better outside central Europe but I somehow doubt it). But I digress. I would conclude with the optimistic notion that nowadays science news are widely available through all possible means: not just TV, radio and pop science books but also various websited dedicating to informing about science, YouTube channels etc. And it's incredibly easy to get to these information and especially children can work with new media well. So I guess this and other knowledge too may make its way to the public better than ever before and if we try to ignite curiosity about scientific questions in children, it can improve more over time. If my article helped arise curiosity and the will to ask and answer interesting questions in just one person, I guess it fulfilled its most important purpose. It did, yes. Thank you. In America where I live, there is disturbingly little acknowledgement of the changed planetary assignments that happened in 2006. Schoolbooks still show only nine planets, and students are not learning about recent discoveries in astronomy. Some students are probably learning about these things on their own, thank goodness, but most students -- and even adults I've talked to -- have no idea there are more than nine planets. Then again, this is America, ranked 37th in the world, behind several third-world countries, in basic education. I'm glad Europeans and other people around the world are more up-to-date. Hopefully textbooks here will soon present a more accurate view of the universe.